So what's le solution? Living outside! 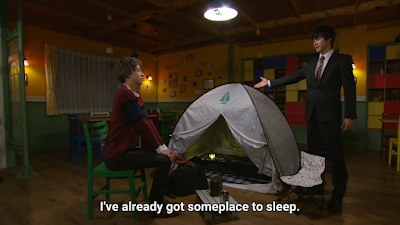 Keiichiro goes to live outside so he can do his duty. 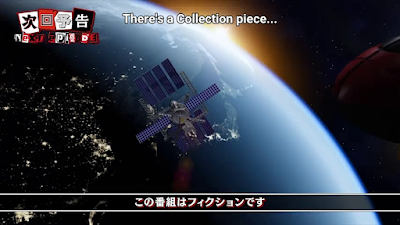 I think it's really FUNNY how Keiichiro wears his business suit in this scenario. He could have worn less casual clothes but again what do you expect from him? 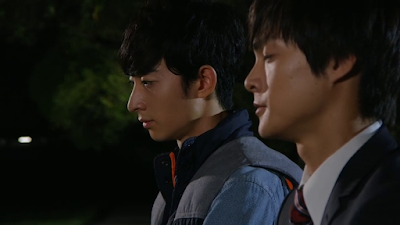 I really laugh at this scenario when he ends up meeting both Touma and Umika outside. For a thickheaded idiot -- I do appreciate whatever good Keiichiro has as a character. He's always concerned about others and won't put the lives of others at risk for his own pride. 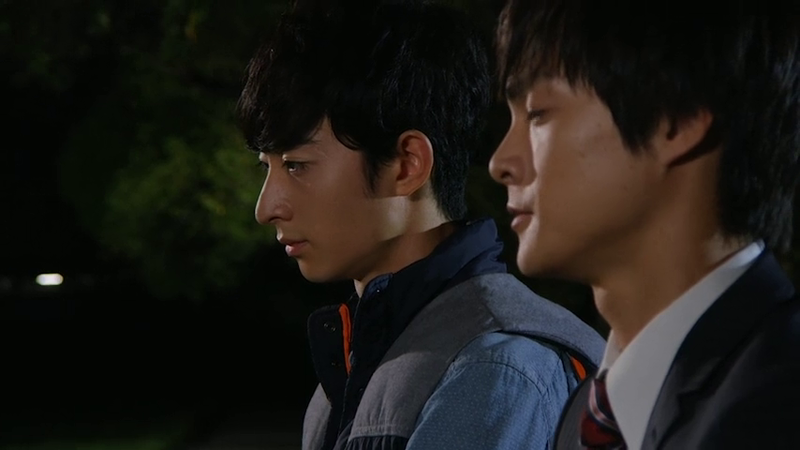 I love this scene when he starts talking with Touma. He mentions about Kairi's unusual emotions. 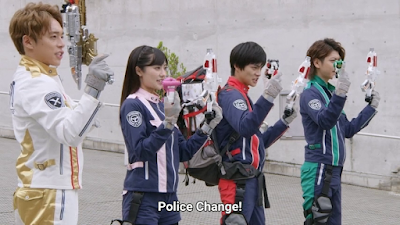 I wonder when will the writers make le Patrangers discover le identities of le Lupinrangers? What will Noel do when that inevitably happens? This is also one funny scene. He begs to sleep at Le Bistrot Jurer and brings his tent. Sheesh! 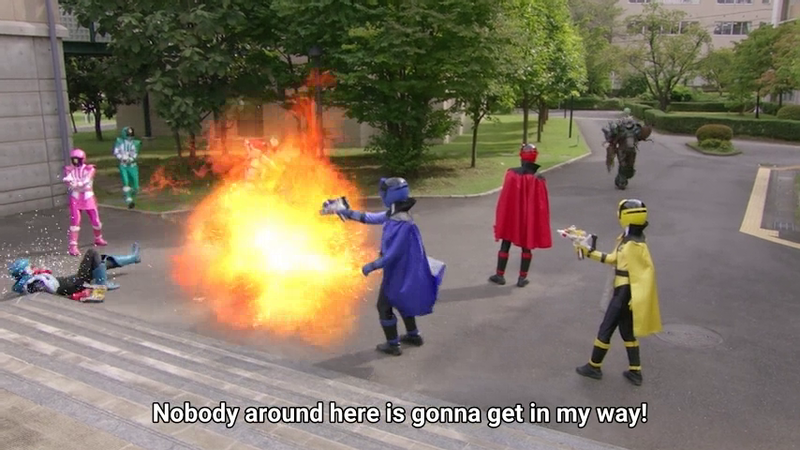 I really LMAO at this scene considering how funny it is. I really feel sorry for Kairi having to watch over Keiichiro sleeping in Le Bistot Jurer. Turns out that le solution is working. Stay outdoors? 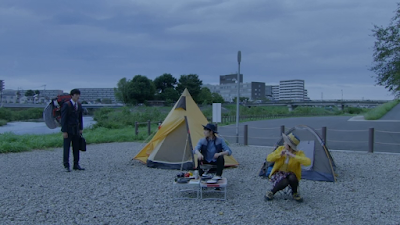 Well, Keiichiro brings his tent so he doesn't get forced back to his home. For someone who's rash -- he still has some thinking left. Keiichiro's willpower makes him do absurd stuff for le greater good. They get le treasure but le current predicament is too much. They must defeat Gohome as soon as they can! Le trick? Well Lupin Red decides that they'd combine into Good Cool Kaiser VSX yet again. What choice do they have in order to end le battle quickly? This doesn't sit too well but there's no choice. 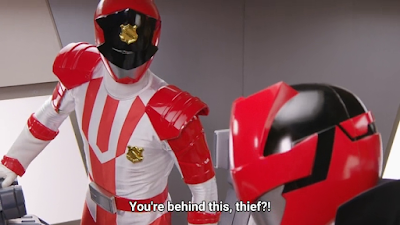 I still wonder how will Patren-1 soon figure out who le Lupinrangers are and what he'd actually do when he discovers that? 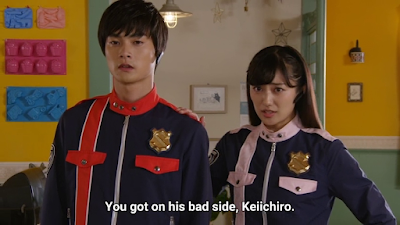 Meanwhile, I think about this moment where I just feel like there could be a Keiichiro x Tsukasa shipping going on -- I'd actually support it if both celebrities are actually dating for real! I still think of Keiichiro's concern for Kairi yet he still doesn't know that said person is le same Phantom Thief he's frequently clashing when they're in spandex. I'm wondering are most suit scenes here really played by le actors except for the more risky ones? Looks like it. But what I'm not liking so far is how less action-oriented episode this is while the J-Drama elements is making up for it. Next week would be an advanced treat. This week features a ghoulish monster. Next week would present some great new Bandai merchandise. I hope that le new inventory would end up creating new revenues for le show!